"The Comboist Manifesto: A, B, C"
Probably because I'm lazy and terrible, I haven't actually been involved in judo lately, but I used to be pretty active in it, starting around a decade ago. I was in high school. I was then and am now very, very bad at judo. You probably think I'm bringing judo up so that I can use it as a metaphor, something about applying martial arts to theorizing concepts in Magic. Actually, I hate it when people do that sort of thing. In fact, I hate it so much that I hunt down the perpetrators and put them in armbars until they promise to never, ever do it again. No, I brought up judo for a totally different reason. I mean using Sphere of Resistance is basically setting up a sleeve-choke because—oh, I'm armbarring myself now. I'd better promise never to use martial arts as a cheesy metaphor, or else I'll have to type the rest of this article one-handed. Anyway, judo has a very elaborate naming system for its throws, but isn't quite as thorough for techniques that are not throws. Many people in judo borrow descriptors from Brazilian jujitsu for positions in which they are grappling on the floor. The relevant part here is that my coach in high school didn't like the use of terminology from Brazilian jujitsu, but did adopt a system introduced by a visiting Japanese coach, in which positions on the ground are designated “Pattern A,” “Pattern B,” and so on. I was never able to remember which pattern was which, a problem I attribute to the lack of apparent connections between the letters of the alphabet and the relative positions of human bodies and limbs grappling on a mat. Despite my misgivings, I am taking a page from that book. I am applying something that I learned in judo and disagreed with to something in Magic: the Gathering. I use “Pattern A,” “Pattern B,” and “Pattern C” to classify combo in Magic. This would probably seem more appealing right now if I'd come up with a more compelling inspiration for my system than “my judo coach introduced this system that I didn't like at all, and here's my system that is based on a system that I hated.” Apparently, I am too lazy to lie right now, so all you get is the true story behind this. I am sorry for that. I've already outlined the use of combo elements and classification of decks in the aggro/control/combo framework. But that was just my interpretation of a concept that is already a popular concept in Magic. I've separated this spiel on Magic theory from that one because this is something new. Well, it's not new to me: I've been thinking about this for years. But I do view this as my big contribution to theorycrafting in Magic—something that I haven't seen anywhere else, but that I view as a useful way to classify one aspect of the game. And here I am, starting my masterpiece by talking about how I'm bad at judo. Brilliant. My article on combo elements in deckbuilding focused on the extent to which decks are combo decks, distinguishing pure combo from aggro-combo, and such. This is ground that has been covered before, and in many different ways. What I want to present here is a system for classifying different types of combo. Unlike the scheme for judo positions, which confused me, each of my patterns actually stands for something, so I think it should be pretty easy to remember. Pattern A is the most traditional form of combo. The earliest combo decks in Magic were probably mostly Pattern A decks. An aggregate is a group of two or more cards that, when used together, can be very powerful. Aggregates have been a part of Magic since the game was first published, including the iconic ChannelBall concept, a two-card aggregate that can end a game very quickly. Another noteworthy aggregate from early in the game's history is three-card aggregate that caused the original power-level erratum: Time Vault, Animate Artifact, and Instill Energy. By itself, Time Vault just stores turns for later use. By itself, Animate Artifact turns an artifact into a creature. By itself, Instill Energy is a moderately useful enhancement for creatures. Having two out of the three cards in the aggregate isn't particularly interesting. Having all three enables one to take infinite turns, which probably wins the game. Aggregates can be incredibly powerful. But usually, all of the components need to be drawn and successfully played in order for the combo to work. Aggregates that are more compact have an easier time fulfilling those conditions. Most strong aggregates that I've seen have consisted of two or three cards, because having more tends to make the aggregate unreliable. Even three-card aggregates are usually only viable in controlling decks. Aggregates of only two cards are more flexible as far as deckbuilding goes. Even in very casual settings, I tend to advise players against using combos that require four or more specific cards to be drawn and played without some sort of support that allows the components to be drawn reliably. It simply isn't fun to hold three useless cards in one's hand or to have them sitting on the battlefield while waiting for the fourth card that will make the other three actually do something. The utility of combo components on their own is an important consideration for the feasibility of aggregates. The components in the old infinite turns Time Vault combo, as I mentioned, do little on their own. An aggregate in which the components are useful, independent of their interactions with each other, is stronger. With Pandemonium in play, Saproling Burst can deal 21 damage directly to an opponent (this is achieved by successively removing counters from the Saproling Burst and directing each trigger of Pandemonium to an opponent). Even without the combo, both cards are useful. Pandemonium turns every creature into a source of direct damage, while Saproling Burst temporarily provides creature tokens of various sizes. For years, I used Pandemonium and Saproling Burst in a red/green deck. I was happy to see either enchantment, and won using the combo if I managed to play both. An important consideration in using aggregates is the the likelihood of a game state in which the combo can can be used successfully. Even if an aggregate consists of only two components, and even if the effect those two cards have is extremely powerful, that's all meaningless if the cards cost too much mana to be played in time to win the game. In the case of the old Time Vault combo, it takes three cards and a total of 5UG to work, with the additional specifications that Time Vault must be played before Animate Artifact and that Instill Energy must be played after Animate Artifact, but with the option to spread the mana cost over three turns, so that the most that is ever needed at a time is four mana (but the card that costs four mana must be the second card played, not the third). This aggregate is rather weak by today's standards, although it would have been more viable at the time it was in use. In contrast, the combo currently used where Time Vault is allowed usually consists simply of Time Vault and Voltaic Key. For this combo to work, it takes two cards and a total of 4 mana, which can potentially be paid over multiple turns in parts, 1 for Voltaic Key, 2 for Time Vault, and 1 to activate Voltaic Key. It also requires a permanent source of at least 1 mana in order to keep activating the Key every turn, which is usually achieved in the process of getting the first four mana to play the combo in the first place. It might seem silly to point out that “Time Vault + Voltaic Key” is a better combo than “Time Vault + Animate Artifact + Instill Energy.” But it's a good example of how to evaluate aggregates. The simplest, and most important, reason that the original Time Vault infinite turns combo is worse than the Voltaic Key version is that one aggregate requires three cards and the other only requires two, and that's still only part of the story: the original combo requires more mana, more colored mana, a specific order in which components must be played, and is more vulnerable to disruption. The Voltaic Key version can be stopped by cards that destroy artifacts. The original version can be stopped by cards that destroy artifacts, cards that destroy enchantments, cards that destroy creatures, and cards that do 2 or more damage to creatures. When using aggregates in deckbuilding, it is important to consider all aspects of the feasibility and efficacy of the combo. Not every successful completion of an aggregate wins a game, and some aggregates are not meant to. One combo that has been highly successful in Vintage is Fastbond + Gush. The cards don't win the game together, but the aggregate is extremely strong for several reasons. Both cards are quite good on their own, with Fastbond enabling multiple land drops each turn and Gush drawing cards, for the cost of bouncing lands instead of paying mana, if necessary. Together, they can draw cards and produce mana simultaneously, with each additional copy of Gush allowing the interaction to take place again. The effect of the aggregate isn't game-winning by itself: usually it's drawing two cards and getting two mana in exchange for 2 life. The efficiency and potential repeatability of the combo and the strength of the components on their own has made this aggregate so strong that, for a time, Gush was restricted in Vintage (Fastbond was already restricted). Aggregates are used to some extent in decks everywhere. In my “Combo Elements in Deckbuilding” article, I touched on ways that they appear in aggro decks, control decks, and hybrids. Since my focus is on combo decks, I'll note some of the more historical combo decks that are heavy Pattern A decks, ones that use aggregates: MaskNought and Stiflenought (using Phyrexian Dreadnought and another card to play it without triggering its ability), Fruity Pebbles (using Enduring Renewal + Goblin Bombardment + Shield Sphere or any creature that costs zero mana to deal infinite damage), Dark Depths (using Dark Depths + Vampire Hexmage to get a 20/20 indestructible, flying creature), Donate Illusions or “Trix” (using Donate + Illusions of Grandeur to gain 20 life and make an opponent lose 20 life), Reanimator (using Entomb + Exhume to get a huge creature onto the battlefield, sometimes on the first turn), Cephalid Breakfast (using Cephalid Inkshrouder and a card that can target it for free to dump cards into the graveyard, setting up a second combo using spells with the “Flashback” mechanic), and Painter Stone (using Painter's Servant + Grindstone to deck an opponent). From what I've said so far, it might seem as though I'm merely substituting the word “aggregate” for the word “combo.” I've defined “aggregate” as two or more cards that do something powerful together, which sure sounds like a combo. Well, keep reading. You'll see. Pattern B revolves around individual cards. Bombs. A bomb is a card that has a large impact on the game, either winning or setting things up for victory, and does so without requiring a specific combination of cards in hand. Instead of needing to draw another specific card, bombs rely on their own particular conditions about the state of the game in order to function. I've seen bombs referred to as “one-card combos.” I don't know when combo decks of this type first rose to prominence. All of the very old combo decks I can remember are pretty clearly Pattern A decks. I think that the first time I was personally exposed to this sort of combo deck was shortly after Urza's Destiny was released, when I ran into decks based entirely around Yawgmoth's Bargain. With a sufficient remaining life total, these decks could draw a sufficient number of cards to create enough mana acceleration for game-winning combos. A great example of a strong bomb is Hermit Druid. Given a deck that has no basic lands, Hermit Druid's ability can, in a single activation, dump one's entire library into one's graveyard. Hermit Druid was printed in Stronghold, but didn't really become a bomb (as far as I'm aware) until the “Flashback” mechanic allowed for a combo finish to be played from one's graveyard. For decks based around Hermit Druid, it was ideal to have a spell that could bring a dead creature back to the battlefield, such as Exhume, in hand, but this was not strictly necessary: Krosan Reclamation, played for its flashback cost, could be used to obtain Exhume. Exhume could then be cast to bring Sutured Ghoul onto the battlefield, exiling multiple large creatures (such as Verdant Force) to become big enough to kill in a single attack. With Anger in one's graveyard and a Mountain in play (early Hermit Druid decks used a single Mountain and found it before winning using using Hermit Druid itself), Sutured Ghoul has haste and can immediately attack for lethal damage. With Hermit Druid, Mountain, Krosan Reclamation, Exhume, Anger, Sutured Ghoul, and multiple large creatures, this uses nine cards, maybe more, to kill an opponent. A nine-card aggregate would be horrible no matter what it did. But even if those cards have to be in the deck in order for the combo to work, they don't actually need to be drawn. In some cases, it's bad if they are drawn. The only card that is actually necessary, as something that is drawn and played from one's hand, for the combo to function is Hermit Druid. Newer sets made Hermit Druid an even more powerful bomb, but not before the card was banned in every sanctioned format other than Vintage. The preferred kill mechanism for Hermit Druid these days, if the card were available in Legacy, would probably be to use multiple copies of Narcomoeba, put them into play while the rest of the library got milled, sacrifice them to flashback Dread Return, use Dread Return to bring back Angel of Glory's Rise, use Angel of Glory's Rise to bring back Laboratory Maniac and Azami, Lady of Scrolls, then use Azami's ability to tap either wizard and win the game. With a sufficient number of lands, Scapeshift can be a bomb. Sacrificing two lands can fetch Dark Depths and Thespian's Stage. With two more mana, this yields a 20/20 flying, indestructible creature. For a more direct approach, sacrificing more lands could fetch two copies of Valakut, the Molten Pinnacle and multiple mountains, dealing six damage for every mountain. Like Hermit Druid, Scapeshift functions as a bomb by using other cards from one's library. This could be interpreted as transitioning from a bomb to an aggregate. And this is an important consideration in cases where opponents can't or don't disrupt the bomb itself, but have something for the cards that follow as a result of the bomb. There is still a distinction though: with Pattern A, one hopes to draw, play, and use two or more cards to generate a powerful effect, but with Pattern B, once the bomb is successful, any other cards involved are made available as a consequence of the bomb. They might be combo components, but for the purposes of playing the deck, they aren't like the components of an aggregate. They are chaff. They have to be included in the deck, but one need not draw into them. The concept of having chaff, cards that are never intended to be drawn, but that are obtained and used through some combo, isn't unique to Pattern B decks. Hermit Druid, a bomb, can self-mill, then use chaff cards from the graveyard to win. In Cephalid Breakfast, an aggregate achieves the same result. Chaff is necessary for some combos to function, but should be minimized where possible, as it takes up deck space. Not every bomb requires chaff. Goblin Charbelcher can potentially deal lethal damage without any consideration for the contents of one's library, just so long as those contents are not lands. However, most game-winning bombs require some chaff. Wizards of the Coast can make mistakes, but they usually avoid printing cards that win the game too easily. Goblin Charbelcher is the most noteworthy exception, and it requires a deck to be built with almost no lands. Excluding cards with very high mana costs that are ramped into or played to end long games, most decks don't have bombs in the sense I've been talking about—cards that win games outright. If they did, they'd be Pattern B combo decks. It wouldn't make sense to put a card into a deck that can easily be played, wins the game if it hits, and then refrain from focusing the deck on successfully exploiting that card. Bombs that, while not definitively ending games, can put immense pressure on opponents are prevalent, even outside combo decks. Stoneforge Mystic has run rampant in multiple tournament formats, and is something of a superstar in aggro-control decks. The card acts as a sort of bomb, with a small equipment package as chaff (Batterskull, Umezawa's Jitte, and Sword of Fire and Ice are the most popular). Although it's far from an instant win, the ability to find and play the most broken equipment in the game, using the same card, is incredibly strong. I've mentioned Goblin Charbelcher and Hermit Druid as cards that have had Pattern B combo decks based around them. Other notable bombs include Doomsday (there are various piles of five cards that can win the game), Survival of the Fittest (among other things, there are infinite combos involving three creatures that can all be pulled from the library, with the first two going into the graveyard and the last one, having some recursion ability, being played), Gifts Ungiven (as with Doomsday, there are various game-winning piles of cards one can choose as chaff), Natural Order (trading any green creature for something really big, such as Progenitus), Tooth and Nail (very expensive, but it can produce a game-winning effects, including infinite combos), Ad Nauseam (requires life to fuel it, but in a deck based around it, enough cards can be acquired to win the game), and Yawgmoth's Bargain (as with Ad Nauseam, with sufficient remaining life and a variable amount of chaff in one's library, Yawgmoth's Bargain can easily draw into mana acceleration and some combination of cards that use the mana acceleration to kill). Aggregates and bombs are not mutually exclusive. Sometimes aggregates lead into bombs, as in the case of Vampire Hexmage and Dark Depths providing a deadly creature. 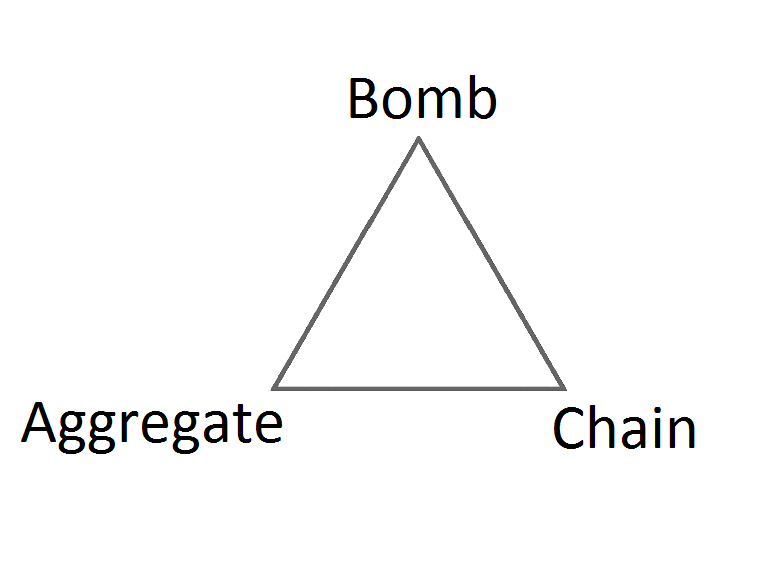 Sometimes bombs lead into aggregates, as in the case of Survival of the Fittest fetching creatures as components for infinite token generation. While I do consider terms to distinguish between these plays useful, the real distinction that I want to present is between Pattern A and Pattern B as strategies. When playing Pattern A, some configuration of cards, with perhaps mild flexibility, is sought. Pattern B, in exchange for more mana, more deckbuilding constraints, or other conditions, only needs a single card. Things that work for or against most Pattern A decks might have different effects on Pattern B decks, and vice versa. At least in theory, Pattern C would have been possible from the very beginning of the game. Very early changes to deck construction rules, restrictions and bans on particular cards in tournament play, and lack of availability of some of the powerful old cards ruled out this sort of combo in Magic for the most part—at first. Visions changed that, introducing enough cards to make Prosperous Bloom viable. Those who are familiar with Prosperous Bloom can grok why I'd want third category for decks like it. For everyone else, an explanation is in order. And to be fair, it's been over 15 years since Prosperous Bloom was a relevant deck. Prosperous Bloom won games through an interaction between Prosperity and Cadaverous Bloom, hence the name. However, those two cards don't really make a good aggregate, and Prosperous Bloom decks didn't play like the traditional combo decks. Instead of attempting to draw and play a small number of components for a combo, Prosperous Bloom had multiple paths to setting up its victory, playing spells that facilitated the playing of other spells that allowed for still more spells, chaining spells together, hence my “chain” label. Prosperous Bloom used Squandered Resources and Natural Balance to generate mana, while simultaneously thinning lands out of its library. It used Infernal Contract, Impulse, Vampiric Tutor, and Three Wishes (also Meditate, once that was printed) to find more cards, Elven Cache to replay spells, and some countermagic and removal to protect itself. Eventually, the goal was to use its mana acceleration to play Cadaverous Bloom and the cards drawn by its spells to produce even more mana, which would enable a Prosperty, followed by an even bigger Prosperity, with the end goal of pitching the massive amount of cards drawn to Cadaverous Bloom in order to fuel a game-winning Drain Life. Squandered Resources and Natural Balance have synergy and could be viewed as a mana-boosting aggregate. Cadaverous Bloom and Prosperity also interacted for highly explosive results. But Prosperous Bloom was not a Pattern A deck. It didn't attempt to just draw Prosperity and Cadaverous Bloom, then play them both. That would be too slow. The point of playing a Pattern A combo is to assemble the combo pieces and use them. Spells that draw cards or that find particular cards are useful for Pattern A decks inasmuch as they give access to the components of the combo. Prosperous Bloom didn't need to draw a particular aggregate of cards (although drawing Squandered Resources early on was important to keep the deck from being too slow). Having Prosperity and Cadaverous Bloom in its opening hand wouldn't even be particularly desirable, because the idea was to draw more cards and generate more mana before casting those spells. In Pattern A, spells that give access to more cards are good because they can help dig for particular components. In Pattern C, spells that give access to more cards are the plan from the start. Since Prosperous Bloom, chains have had a prominent place in Magic. Decks based around Tolarian Academy, mana-producing artifacts, and blue card-drawing spells to chain into Mind Over Matter for more mana to fuel Stroke of Genius led to what was nicknamed “Combo Winter” and the eventual banning of several cards. Cards that are seen as making chains too potent have been some of the most heavily banned and restricted cards in DCI-sanctioned formats. To an extent, this is warranted. The nature of Magic is such that, if enough powerful card-drawing and enough powerful mana acceleration is available cheaply, chains become the fastest, most reliable way to win, with no real drawback. I've experimented with this concept myself using Magic simulation programs and testing decks with multiple copies of cards like Black Lotus, Ancestral Recall, Mana Crypt, Timetwister, etc. By my estimation, over twenty of the cards on the Vintage restricted list are ones that, if unrestricted, would empower chain-based combo decks substantially more than any other decks. The same could be said for the Legacy banned list. Chains are so dangerous because, unlike aggregates and bombs, they do not rely so heavily on drawing particular cards. When an entire deck is capable of acting as an engine that goes through cards until it has what it needs to win, reliance on finding and resolving specific threats is greatly diminished. The difficulty is that to achieve this robustness while maintaining speed, chains have severe deckbuilding constraints. In some formats, it is impossible to make them work at all. In other formats, while chains are technically available, they can be too inconsistent to make for strong decks. Since the advent of the “Storm” mechanic in Scourge, the most prominent chain-based combo decks have been storm decks of some sort. Most storm decks aim to kill with Tendrils of Agony, Brain Freeze, Empty the Warrens, or Grapeshot, and setups vary considerably, but they almost always involve mana acceleration and card-drawing. Because it gets stronger as spells are played, “Storm” is a natural fit for Pattern C. If one is going to be casting lots of spells anyway, cards that are stronger based on the number of spells cast in a turn become exquisite. While storm decks epitomize Pattern C, entirely different mechanics have been used to generate some impressive chains. Artifact-heavy decks with “Affinity” can rapidly take over games (especially with Skullclamp). There's also the “Dredge” mechanic, while not really similar to anything else in Magic, allows for a bizarre sort of gameplay that is mostly evocative of chains. Instead of chaining spells together, dredge decks chain effects that dump cards from their own libraries into their graveyards, then use the cards in their graveyards to play swarms of tokens or to put powerful creatures onto the battlefield. For its simplicity, this is the best classification scheme for combo decks that I've seen so far. And I'm totally not biased just because I invented it or anything like that. Unfortunately, because of its simplicity, my approach doesn't capture everything. For example, some people have built decks that use spells with the “Cascade” mechanic and have, as the only spells that are cheaper than their cascade cards, spells with the “Suspend” mechanic, such as Hypergenesis. There's no aggregate: no attempt is being made to draw and play two cards that interact with each other to do something powerful. There's no bomb: the cascade spells are mundane by themselves, and different cascade spells can be used to achieve the same purpose. There's no chain: A single cascade spell being cast is sufficient. I can think of a few other weird examples, but the point is that some decks, which could still be thought of as combo decks, fall outside my classification scheme. The vast majority, though, can be explained quite well using the ABC's. Besides serving my own personal obsession with classification, I contend that the distinctions I've presented here are useful. Ideally, I would demonstrate this by meticulously mapping trends in each of the three categories, but that sounds a lot like work, and I haven't done it anyway. Not yet. Until recently, all I had to show for this would be anecdotes or references to personal experience with some speculation thrown in. Par for the course, really. However, after I'd gotten about halfway through writing this article and had taken a break from composing it, I found others point something out, which I had not thought of, and which consider to offer some support for my ideas. In a few days, Wizards of the Coast is scheduled to announce updates to the official banned and restricted lists. In the Legacy community, there has been discussion as to whether True-Name Nemesis should be banned. It should be, but that's not my point right now and I won't bother to support it (ask me after the announcement, and I'll pester you about it to your heart's content, and then some). In analyzing the impact of True-Name Nemesis on the format, players are noting that because of the matchups True-Name Nemesis wins for its decks, those decks are free to dedicate more of their answers and sideboard cards to other matchups. As a consequence, the combo decks that had previously been the strongest in the format are, to some extent, being hated out. Meanwhile, some other combo decks are less adversely affected by this development, and the standings of these decks have improved. Although no one else analyzing this issue is reporting it in my terms (which they would never have heard of, as I'm publishing them here for the first time), the results are clear enough. Currently, Pattern C combo decks, which had previously been the most successful combo decks in Legacy, are somewhat disadvantaged against aggro-control decks packing True-Name Nemesis, because the card so thoroughly harms decks in other matchups that these aggro-control decks are able to devote more slots to beating Pattern C combo decks. Pattern A combo decks are less adversely affected. What results from this is anyone's guess, but I count it as a point in favor of my classification scheme. If you actually made it through this whole thing, I applaud your tenacity. But hey, I did warn you in my previous article that this one would be dry and technical. I do not want that to be the norm for my articles, but this was something I needed to do. I may fall back on the classification scheme I presented here for my later articles. And if you haven't read this one, well then, I guess you'll be perplexed. But if you haven't read this one, then you can't really be reading this now, so that doesn't make any sense. I suppose you could have skipped ahead and failed to read most of the article. If you did that, go back and start over, cheater.